If you are one of the lucky ones who still has your mother, spoil her often, and particularly on Mother's Day. I hope this doesn't come as a surprise, but Mother's Day is this Sunday the 13th. Do something with her, or do something for her, and most of all, love her. We have recently been blessed with rainfall, and it seems like we may be in for a wet summer. Yeah! Wouldn't that be awesome? Plant now to take advantage of this treasure - it's free, non-treated water with a neutral to slightly-acidic pH!! The establishment process of your new plants will be a breeze. The Mounts Botanical Garden Connoisseurs Garden Tour - A Mother's Day Tradition - takes place this weekend. Eight exquisitely landscaped and maintained private gardens will be opened to visitors. It's a great opportunity to get ideas of plant combinations and how the plants grow in the various environments. 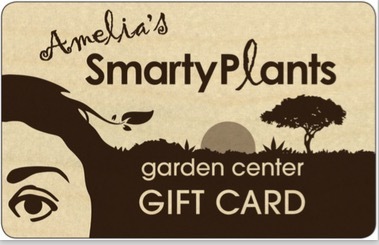 Tickets for sale at SmartyPlants - members pay $20; non-members pay $25. Summer Food - As the winter crops of veggies and herbs die out, plant your summer veggies like squashes, melons, peas, and okra. We are expanding our selection of veggies, and very soon be offering a nice variety of locally grown herbs and veggies. Sun and Shade - Shade changes in the garden throughout the year, which challenges most gardeners as to what type of plant to select for an area that is shaded during winter months and sunny during summer months. Plant for the toughest condition - sun in the summer. It is likely that plants that love the sun can be happy enough during winter with no direct sun, but the reverse is unlikely. Large succulents - Several varieties of Kalanchoe, Senecio, Aloe, Agave, and Cactus. Ornamentals - Clerodendron Minihasse, Crinum Menehune, yellow Oleander, Leonotis leonurus, white Gaura, fragrant Grand Duke Jasmine, beautiful and exotic hanging baskets, and more. Fruit Trees - Abiu, Miracle Fruit, Grapes, Olive, Strawberry Tree, Sapodilla, Mamey Zapote, Rio Grande Cherry, Tamarind, Sugar Apple, Soursop, and many more. Carruth - We've expanded our selection our Carruth collection and have made a section especially dedicated to Mother's Day. Rain Barrels - We've received several inquiries about rain barrels. Stop by and see some made by a local entrepreneur in basic finish and hand-painted decor.